I just entered to win a trip to Brazil for UNEP’s World Environment Day 2012. Read this blog post and discover how the Green Economy includes you! 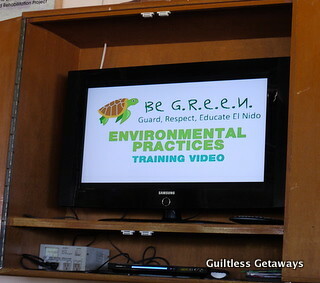 While waiting for a 19-seater Dornier plane to take me back to Manila, I came across a lengthy training video that was being played over and over at the small El Nido airport. I wondered if how many people had even noticed it. I considered myself lucky to have seen it from the start. The message was simple: Be G.R.E.E.N. (Guard, Respect, Educate El Nido). By being a guest at the El Nido Resorts, I knew that I was equally responsible for their conservation efforts. 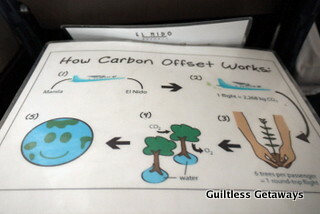 A pamphlet on the plane about their El Nido carbon emission offset contribution program explained where a part of our airfare will go. They had enjoined me in their cause from the day I had arrived by telling me to take nothing and leave nothing but footprints and memories. They had also given me a checklist in case I see some endangered species throughout my trip. But, somehow, this video took me further. I learned of their environmental practices such as waste segregation, recycling, water treatment, energy conservation and many more activities that they have done for more than a decade. The thing is, I believe, what is more crucial now is how we use this information after we had gotten it. I, for one, just took it all in and I was proud to have stayed in and gotten to know a resort's efforts. I said to myself, "Hey, now it's understandable why they charge so much. Or at least I know that the money is being spent well somehow." That was how far my participation went as a tourist. There are so many people who are telling us about going green. It might even be trending in Twitter now and we see it. The question is, what do we do after we see it? 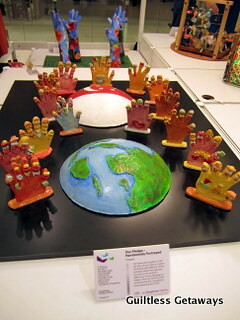 This display was created by the children of Singapore. What more can we do as fully grown men and women? Our hands join together to tell the story of our unity as a nation. The hands with different colors and faces depict the openness we have to one another's differences in race, language or religion. Thus we move forward harmoniously like a symphonic band impacting the world. Today is a chance to take my participation a notch higher. Why not travel and go meet the experts to know more about Being Green? I had fun with my experience with nature in Singapore and learning about sustainable tourism and ecoliving in Nuvali. To my dear readers and friends, this is a chance to win a trip to Brazil for UNEP's World Environment Day 2012 with TreeHugger and UNEP! It's time to meet other enthusiasts all over the world. I do encourage you to join this contest as well and start sharing about the Philippines' and Filipino's participation in the Green Economy. 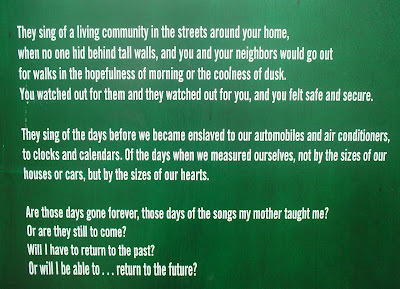 You'll find this yearning wall in Nuvali. Entries must be received by February 12, 2012! Do share your entries with me. The world is looking for Green Bloggers. Click here to join the UNEP-TreeHugger World Environment Day Competition.